In Pt1 I briefly explained how I began shaping my ideas of how Google Apps for Education could be used in a primary school. After explaining my thoughts and showing her 'models' I'd created, my wife who is currently acting head teacher at Rhws Primary School wondered whether these tools and services delivered by Google, could help to improve communication between the staff in her school? But it was clear when we started to discuss this further that it wasn't just communication between staff that we were trying to improve, it was many of the administrative practices that teachers had to carry out that could be improved too. I think it's important to bare in mind here that the school began this process before the Hwb+ national platform arrived for schools in Wales. However, I believe that most of the approaches that I'll describe below are as relevant to all Welsh primary schools about to launch with Hwb+ or any other learning platform. For instance the new version of Microsoft Office 365 (which is included in the Hwb+ platform) has many of the same features as Google Apps for Education (email, calendar, document collaboration) and from what I've seen of the Hwb+ platform, it too lends itself perfectly to the ways of working I describe below. 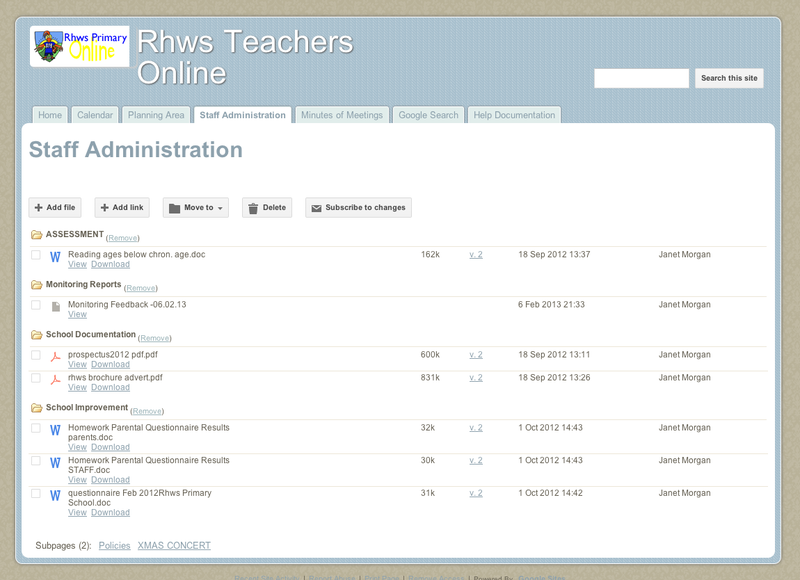 The platform 'Rhws Teachers Online' was constructed using Google Sites. 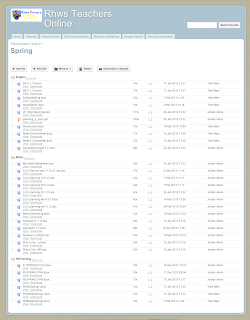 Once a member of staff had logged in they would have easy access to a variety of shared documents and school calendar, alongside tools and services such as email and their own Google Drive. 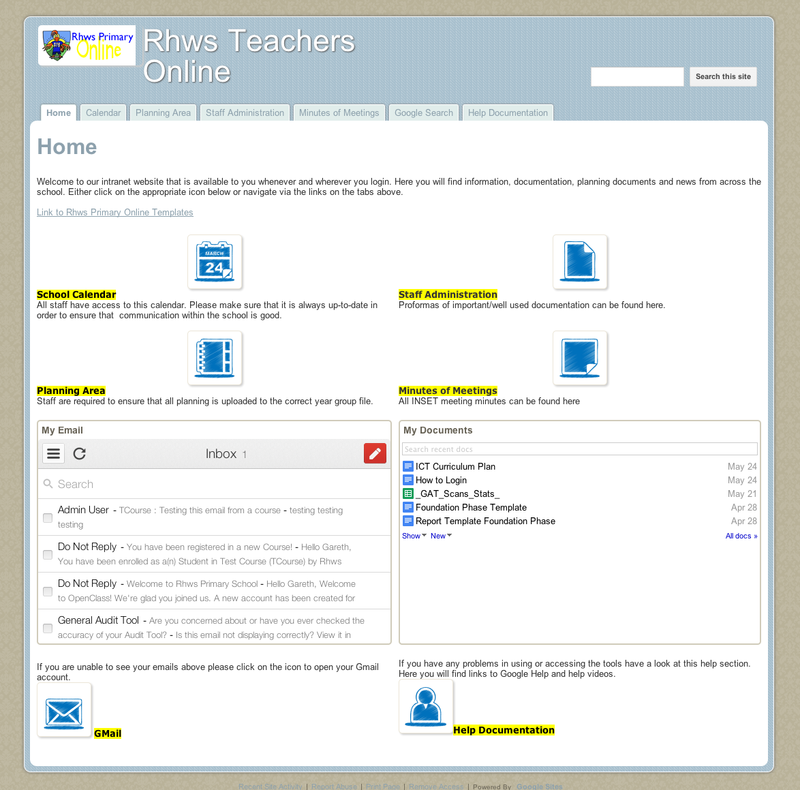 This would be the first time that the school would have its own unique email address for all staff (@rhwsprimaryonline.co.uk), removing the need for them to use their own personal email addresses for work related communication. 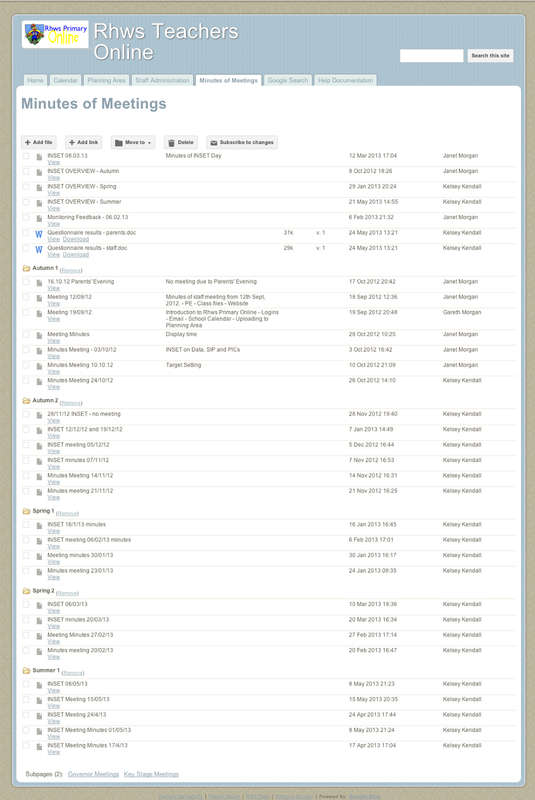 Each user has 25GB of Gmail storage and 5GB of Google Drive storage. Another positive reason to work in 'the cloud' is that it should be no longer necessary for staff to carry USB drives around with them. Upload your file from home to Google Drive and download and use at school. Toward the end of September 2012 the acting head teacher introduced the platform to teachers. During an after school meeting teachers were given their usernames and passwords and initially taken through the login process. They were taken on a quick tour of the platform and shown how to access their Gmail account and then left to 'play'. A couple of weeks later the teachers were shown how to upload documents to the planning area and how to use Google Drive to create and store documents. The majority of teaching staff picked up the necessary skills very quickly and by January 2013 all staff were using the site on a regular basis, uploading their planning files and reading and sending emails. Users could either login to their account via the Google search page or via a link on the school website. 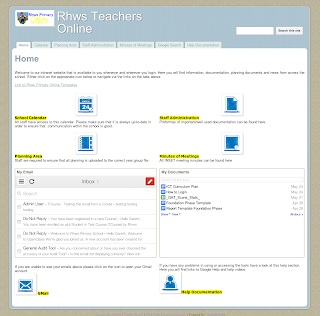 It was recommended to staff to login via the school website as this directs the them to the Rhws Teachers Online landing page. I'll take you through a couple of the sections found on that site. From my own experiences of teaching in a primary school I felt that there was a strong need for an online calendar that was shared with all staff. In many primary schools the school diary tends to reside in the secretary's office or with the head teacher. Therefore it could be only viewed while in school. The only other source of information is often a dry wipe whiteboard in the staffroom where the week ahead is written out for everyone. 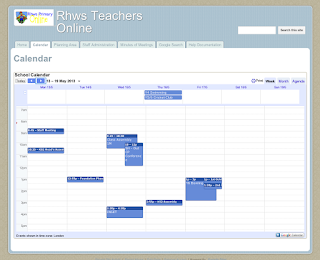 Google Calendar has been embedded into the page and is regularly updated by the acting head teacher. Several members of staff now access this calendar along with their school email account via their smartphones. Much of the planning at present is in the form of previous planning being uploaded as Word documents. However, the intention is to slowly migrate completely to Google Docs. This would allow for easy collaboration between staff on planning (sharing the workload) and allow for much easier updating of the planning in the following academic year. There would be no need to upload new documents, just amend the existing. A good example of one of the benefits to moving the planning area to 'the cloud' was when a member of staff was unable to come into work due to illness on the first day after the two week Christmas break. "Don't worry" she said, "all the planning has been uploaded." It was easy for a member of staff to login and print off the relevant pieces of planning for the supply teacher that day. Quite a useful feature is the 'subscribe to changes' option that's available on many of the site's pages. By clicking this option you get an email sent to you every time someone uploads or makes a change on that particular page. 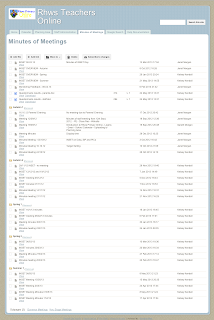 A useful way for SMT to quickly monitor who has uploaded their planning or any other document. All meeting minutes are now written up using Google Docs and almost immediately after the meeting shared with all the staff. The acting head teacher feels that the positive impact of this is that all LSAs and admin staff are able to easily access information from meetings that they are unable to attend. Various types of document are held here, such as school prospectus, results from parental questionnaires and policies. A very useful function of this area was in its use for the school Christmas concert. Music backing tracks, lyrics, cast lists, scenery list, etc. 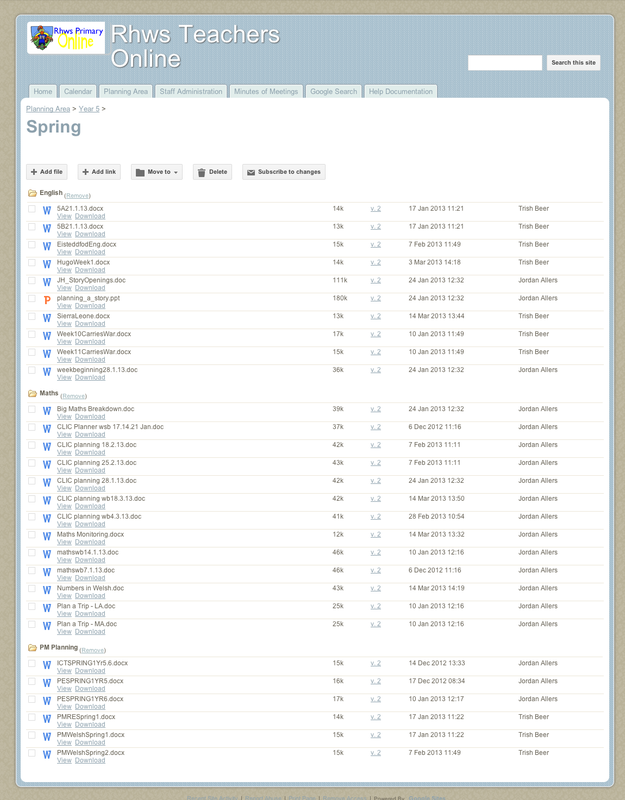 was uploaded for each of the relevant classes to access. All these groups now have access to the same document - therefore there's "one version of the truth". 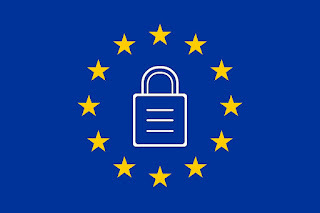 No need to print off reports that might have to be amended and reprinted, or digital files being emailed or transferred to others on an USB drive with the worry that they might be deleted, corrupted or which file is the latest version. So far, so good, and I'll post a blog about this approach to report writing once all the reports have been completed. 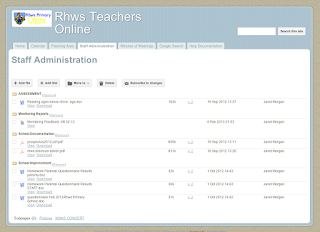 In Pt3 I'll look at how pupils started to use Google Apps and some thoughts about how the school sees the various tools and services, including Hwb+, being effectively used for learning and teaching from September 2013.